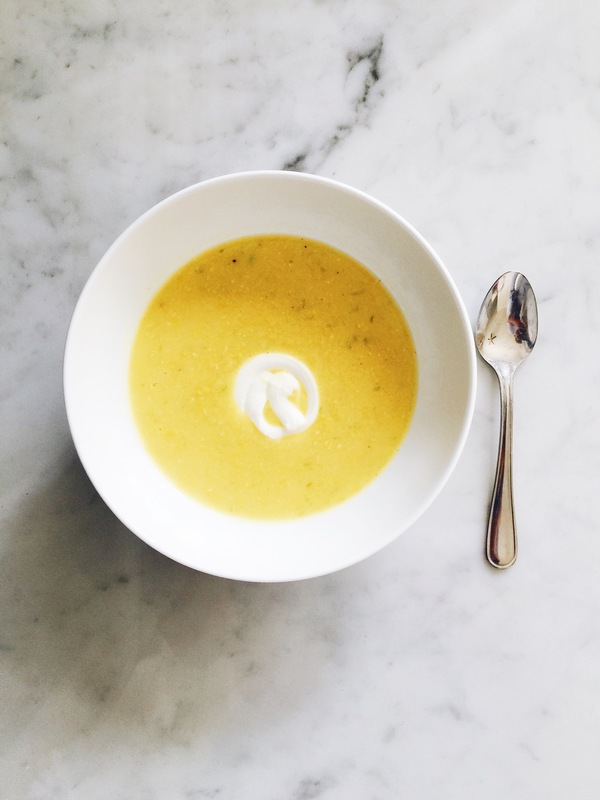 Continuing with the quick meal posts, today I’ve got a sweet corn soup that has long been a favorite in our house. It’s a delicious combination of sweet corn, spring onions, and cool yogurt, topped with cheesy nachos. Yes, nachos! I deeply suspect they are why my kids love this soup so much, but as long as the bowls come back empty and they have satisfied smiles on their faces, I’ll keep making it. This is adapted from a recipe by Nigella Lawson, who I adore. There’s something about the way she side-glances into the camera on her show. It just feels like she’s a friend divulging her cooking tips while you sit taking notes in her kitchen. She put this together with a couple pulses in a food processor and a few minutes on the stove. Who knew it would be so deeply satisfying? I hope you’ll find it to be the same for you. Blend drained corn, green onions, and cornmeal in a food processor until it is puréed. You can use a regular blender too. Pour into a large saucepan, and place over medium heat. Add the chicken broth, half and half, and cayenne pepper. Let simmer until thickened and warmed through, about 10 minutes, stirring occasionally. Season to taste with salt and pepper, if necessary. Meanwhile, while soup is simmering, line a baking sheet with aluminum foil. Spread out tortilla chips and sprinkle with Colby Jack cheese. Bake in oven until cheese is melted, about 5-7 minutes. 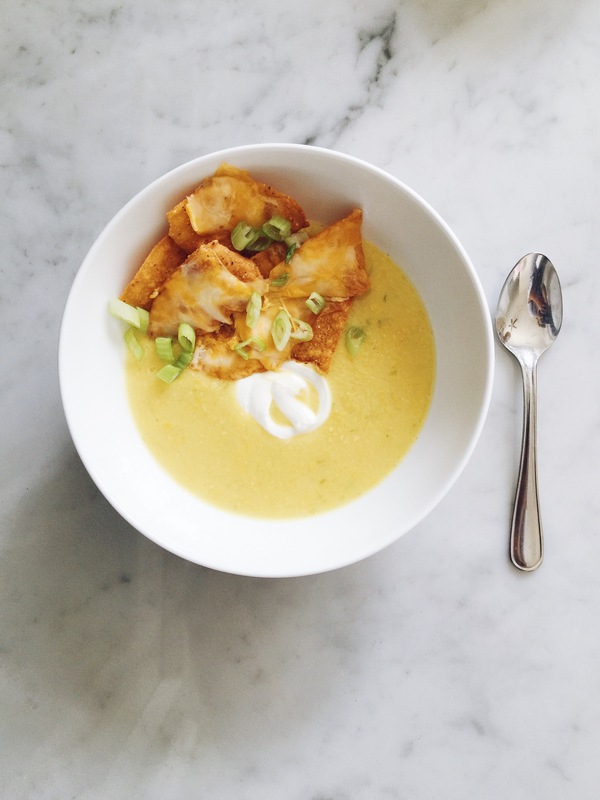 Serve soup in bowls topped with a little Greek yogurt or sour cream, green onions and cilantro, and a big pile of melty, cheesy nachos. Warm, tasty, and easy soup fast enough for a weeknight, and hopefully delicious enough to make your list of favorites.